One of many great photos that we took of Kami. A few weeks ago a friend of mine, Tammy, contacted me about a high school junior which is her God-daughter. Her name is Kami Malone. She informed Kami of our SCA model program and within a day, we received her application. We're so happy to have her on board as our Class of 2015 SCA model. She's a very talent Southern Belle of South Garland High School. She enjoys music, her friends, and especially dancing. 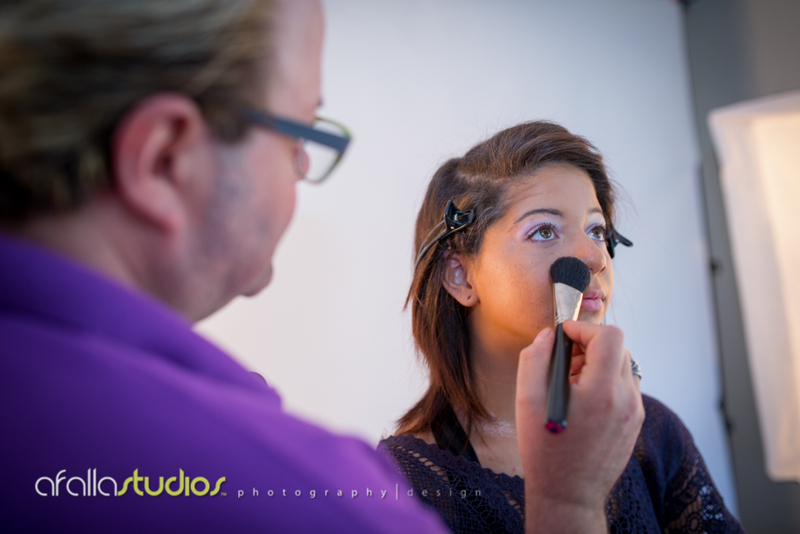 Her day started off with a makeup session with makeup extraordinaire', Michael Greene. Michael's MAC Cosmetic experience always comes in handy with all of our clients. I encourage everyone to use his services because he really knows makeup, educates his clients on how to do their makeup, and is the key to a successful senior portrait session. Kami getting her first layer of makeup applied by Michael Greene, makeup extraordinaire. After her makeup application, we headed out to a park just one block away from our studio. It was very windy so we had to deal with mother nature for this first location but still created some amazing photos. Kami was a little unaware of what to do which is common with all of our models BUT once we started to stream some music to the Big Jambox, she started to relax and have some fun. Thank God for Michael and his makeup tricks and touchups when the wind would blow our model in the face and made her left eye tear. Relaxing under the tree was one of many shots we took and enjoyed the beautiful weather. We had Kami shut her eyes a lot due to the wind, however, we did have the opportunity to snap this photo of her which turned out amazingly beautiful. After our first look, we all quickly headed back to the studio to have Michael create Kami's second look- a more fun, trendy, supermodel, high fashion look. This is fun for every young lady who enjoys dressing up and feel like a million dollars! Dressed in denim and some cool blue spiked boots, we all drove to our second look in the Oakcliff area. Michael knew of a mural that had some amazing colors. Here are the photos that we took which almost caused a car wreck when some dude kept watching what we were doing with our camera lights, makeup artist, and beautiful model. Too funny! The colors in this shot blew our staff out of the water. We had Kami lay on her back and just have fun with the camera. Having a laugh which made me snap a shot to capture Kami's fun, loving spirit. We finished off the day with a few more photos around the corner and all head for home after a long day. Special thanks to Kami's Mom, Kerri, for helping with caring some of our small bags of equipment (i.e. light diffusers, bluetooth speaker, etc.) Also a BIG thank you to Michael Greene who always makes my SCA models look and feel amazing. We found this other mural around the corner that had some artwork of Dorothy from the Wizard of Oz. We wanted to mimic the cartoon and captured this. Great fun! If you are a high school senior and is looking to have some amazing photos, why not hire AfallaStudios? Unlike other photography services, we separate ourselves from the rest by wirelessly tether your photos directly to our iPad so you can see the digital negatives while we photograph you, play some amazing music that you enjoy listening to, and most importantly, have a makeup artist to transform you into a beautiful butterfly. Our prices are competitive and our print collections are all discounted from our professional print vendors. Contact us today to book your session! Relaxing on the edge of a loading dock that was painted in different blues.